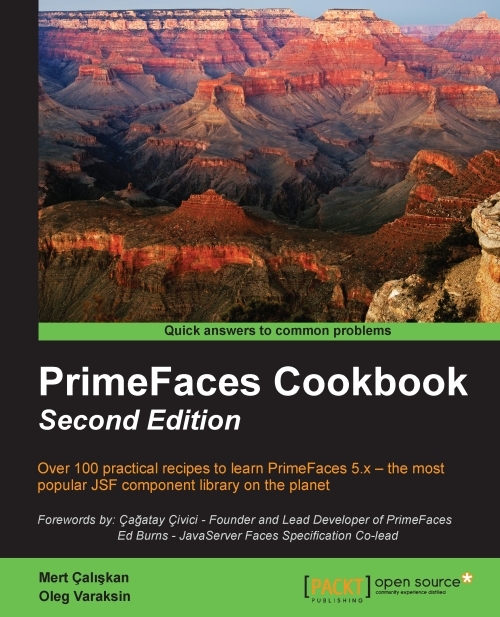 PrimeFaces Cookbook Second Edition was published today. This is an updated second edition of the first PrimeFaces book ever published. PrimeFaces Cookbook Second Edition covers over 100 effective recipes for PrimeFaces 5.x which this leading component suite offers you to boost JSF applications - from AJAX basics, theming, i18n support and input components to advanced usage of datatable, menus, drag-&-drop, charts, client-side validation, dialog framework, exception handling, responsive layout, and more. I have updated the book's homepage with a new table of contents. There are 11 chapters and more than 380 pages. You can download the book's code, clone the project on GitHub, compile and run it. Please follow the instructions on the GitHub. I would like to thank my family, especially my wife, Veronika; our advisers from Packt Publishing, Llewellyn Rozario and Ajinkya Paranjape, our reviewers, the PrimeFaces project lead Çağatay Çivici and JSF specification lead Ed Burns. These people accompanied us during the entire writing process and made the publication of the book possible with their support, suggestions, and reviews. Thanks a lot!